I have been crafting, really! I've slowed down lately, though. (I blame being pregnant, mostly.) I even have a finished project to show you...but not right now. 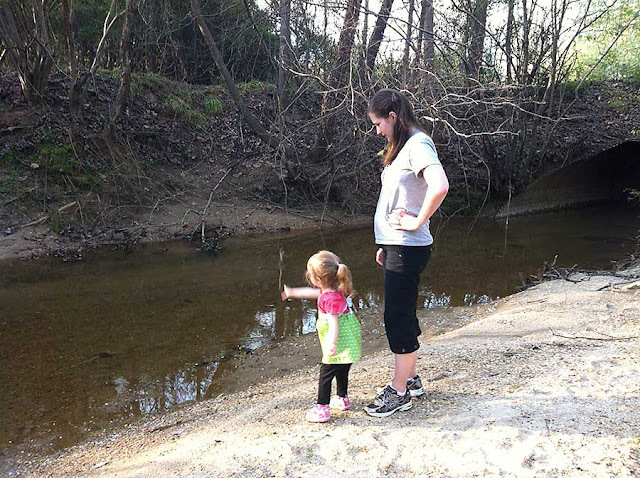 Today's post is about the two main things I've been doing lately: Mommy School and enjoying springtime. First, Mommy School. Boo and I usually just hang out around the house, sometimes coloring, sometimes playing with her toys (Buzz, Mike, and Jessie are by far her favorites--mostly Jessie), and all-too-often playing on the iPad. Frankly, I was getting bored, and I bet Boo was, too. I wanted to add a little more learning, structure, and just new-ness to our daily routine. Enter Mommy School. For this week, we focused on shapes. On Monday, we played the Jumping Game. I cut shapes out of copy paper, laid them on the rug, and told Boo different shapes to stand on, and then "One, two, three, jump off!" 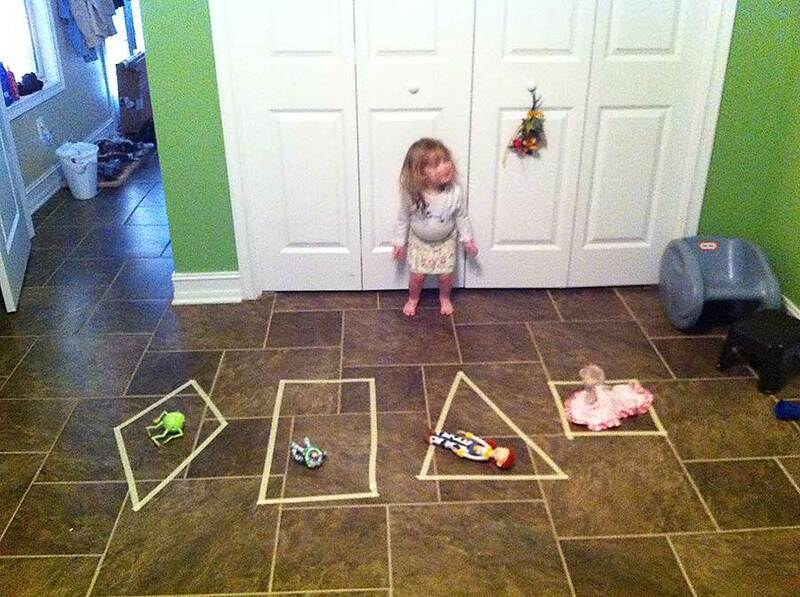 So she was practicing identifying her shapes while jumping all around. 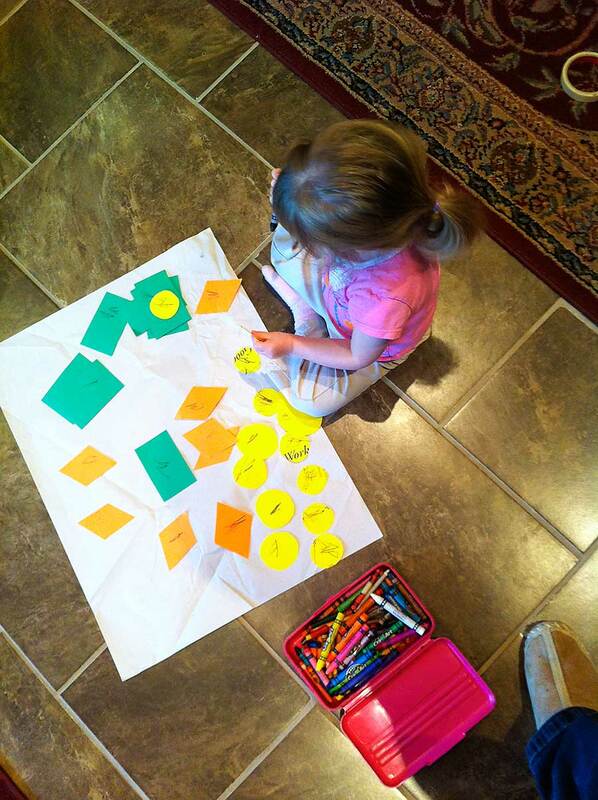 And at the end, she colored all she shapes and we put them up on the freezer to show Daddy when he got home. (Repetition + reinforcement = good!) 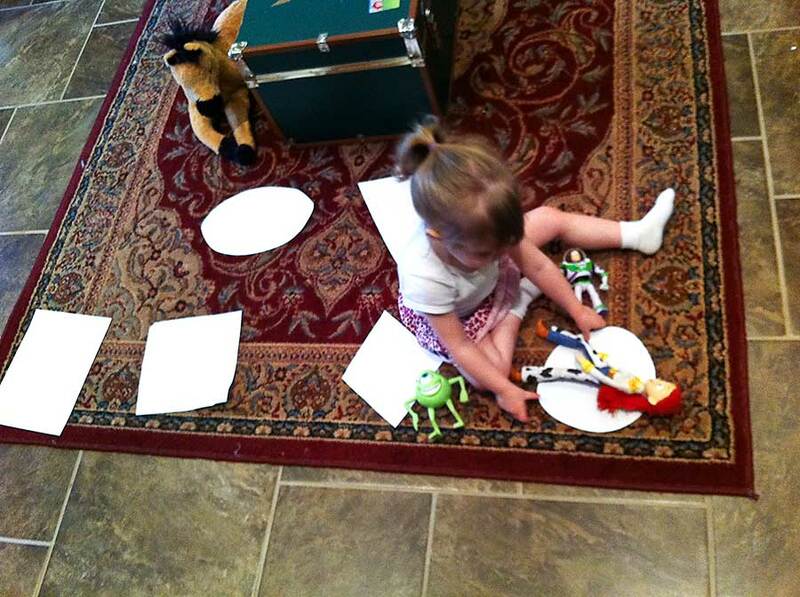 In this picture, Boo was playing her own variation on the game by putting her toys on the different shapes. The next day, we played the Throwing Game. I used masking tape to mark off different shapes on Boo's bedroom floor, intending that we would throw beanbags/soft toys into them. But Boo just wanted to put Jessie, Mike, and Buzz in their own shapes. On the plus side, though, I left the shapes on her floor, and often she'll just walk across them reciting, "Diamond, rectangle, triangle, square" and then go on with whatever she was doing. So, even though the game was a bust, Boo is still learning her shapes. We also did the Picture Game. I cut out shapes from colored paper and stuck tape on the back. Boo stuck her new "stickers" all over a sheet of butcher paper and colored everything. It's up on our freezer, too. I was going to share more, but I don't want this to be the post that never ends. I'll just leave you with one picture of us enjoying my favorite season of the year. Hope you all are enjoying your St. Patrick's Day!